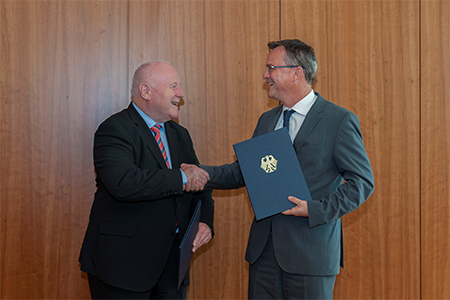 Forum chairman Prof. Milbradt, former Premier of Saxony, and State Secretary Hans-Georg Engelke from the Federal Ministry of the Interior sign the new three year agreement. Germany joined the organization in 2007 and is represented in the Forum by the Federal Ministry of the Interior. The Federal Foreign Office as well as the Federal Ministry of Economic Cooperation and Development also support the Forum. 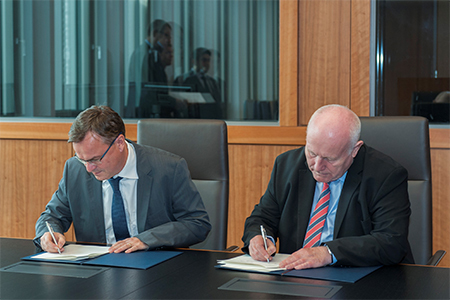 In addition, the Forum holds close working relations with the Bundesrat (Federal Council), the German states (Länder). Since its inception, the Forum held close links with Germany. The Forum has aimed at making a contribution to Germany’s debates on federalism. It provided inputs to the reforms of German federalism in 2003-6 and 2007-9 (Federalism Reform I and II), and it worked on policy issues such as immigrant integration, public security, health policy and other relevant themes. More recently, the Forum co-organized a large international conference in Berlin “Making Fiscal Equalization Work-The Fiscal equalization scheme reform of 2019”. It was jointly organised by the Forum, the Free University Berlin, the German University of Administrative Sciences Speyer and the Bertelsmann Foundation. The focus of the conference was to discuss the pending reform of Germany’s fiscal equalisation system. The conference volume was just published by Barbara Budrich Publishers. The German Government through grants from the Federal Foreign Office and the Federal Ministry of Development Cooperation has funded the Forum’s work in Ethiopia, Nepal and Pakistan with the aim of strengthening federal governance in these countries. In addition, the Foreign Office seconds senior staff to the Forum on an ongoing basis. The new agreement runs from 2016 until 2018.